Our enthusiastic, knowledgeable team deliver high quality, reliable training solutions that will give you the skills to safely work with a wide range of loads and lifting gear on construction and building sites. We operate in Brisbane and surrounding QLD areas such as Sunshine Coast and Gold Coast. Major Training Group has a depth of knowledge that only comes from a family owned business with a history of providing plant and transport services to major infrastructure projects; coupled with some of the best trainers in the industry. For your first or next move in the construction industry, Major Training Group will make it happen. A Rigging licence with Major Training Group is a nationally recognised qualification that will get you construction site ready for a range of roles that involve for example structural steel erection, movement of plant, hoists, mast climbers, and cantilevered crane loading platforms. Our basic rigging, intermediate rigging and advanced rigging courses are all designed to provide you with the right qualifications to complete specific jobs on a construction site. We offer our training across QLD in Brisbane as well as Sunshine Coast and Gold Coast. Rigging Licences have 3 levels which must be completed prior to progressing to the next. Basic Rigging Course takes a step up from Dogman with more advanced safety apparatus and includes inspection of equipment, use of a safety harness, preparing rigging equipment and hazard control measures. Intermediate Rigging Course builds on basic rigging and introduces advanced safety apparatus construction such as the rigging of cranes and the inspection of tilt panels. Advanced Rigging Course builds on intermediate rigging and introduces advanced safety apparatus construction such as the rigging of a span rope, derrick or gin pole, or the installation of a swinging stage. A hi-vis vest and gloves. An exceptional quality competency-based training program delivered by our knowledgeable team. 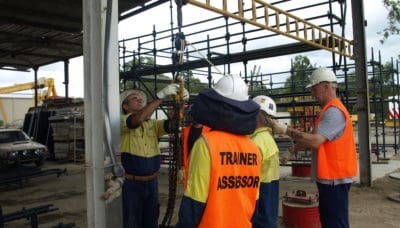 Both the formal and informal requirements of the training are completed in a controlled environment at Major Training Group’s high quality simulated worksites throughout QLD. Students are trained to a competency level suitable to achieve all elements of the assessment. High quality training and materials including log book, training plan, full assessment and training manual are provided. Students complete the mandatory informal training on the job or at their current employment. For experienced and competent operators on completion of formal training. A completed log book with an employer’s letter validating the log is required. High Risk Work licences have a 5 year life span, after this time they licence will need to be renewed. This is done via the WHS web site. If your High Risk Work licence has expired the operator has up to 12 months to renew the HRW licence. If your High Risk Work licence has expired you are not a licenced operator in the period of time. If it is past the 12 month period the operator has no choice but to come and do the written and practical exam again. A VOC cannot be done on an expired licence. Want more than a licence to rig in brisbane, sunshine coast and gold coast? Get a nationally recognised qualification with a our new construction skill program and get a Certificate III in Rigging. Take the next step in the construction industry with a Rigging licence from Major Training Group. Major Training Group is your genuine training partner and we will help you upskill for the future. Consider upskilling your Rigging skills with a Certificate III in Rigging course or combine it with a Safe Working at Heights or Slewing Crane course. Whatever your career goals working with high risk plant, Major Training Group will make it happen.